Saree traders of Tangail are passing busy time ahead of Eid-ul-Fitr. 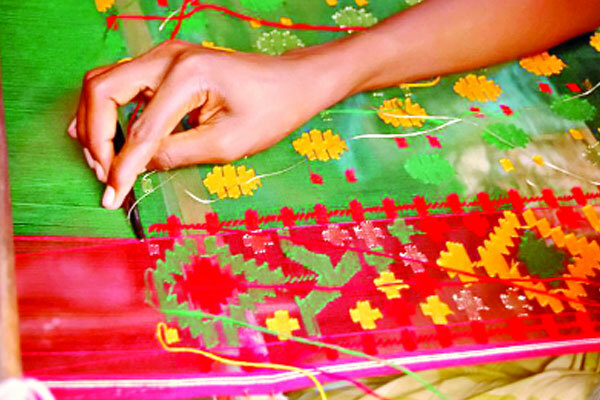 Craftsmen are working day to night to weave Tangail saree in various parts of the district. In the meantime, the saree market has started to become crowded with vendors and customers. The wholesalers of Tangail Saree of the district are collecting Saree from the Pathrail of Deldwer all the day round. The gatherings of customers are growing in the Pathrai village. Centering the Eid, more than one crore pieces of Sarees have flooded in the market so far. The total worth of the Sarees would be TK800 crore on average. Former chairman of Weaving Mills Association Ragunath Bashak said, this year we have brought some diversity in sarees by using various types of yarn. The traders call it by various name after bring them in their shops. He also said that it was difficult to count how many sarees were being made in each weaving house this year. The price of saree varies from area to area. But initially it has assumed that around one crore sarees worth TK700-800 crore will be marketed this year. Saree traders of Tangail said, there has cotton saree worth minimum 350 taka to Tissue Jamdani worth 60 thousand taka in Pathrail. Apart from that, traders are taking 800-4000 taka for Denu silk, 700-3000 taka for half silk , 3000-9000 taka for soft silk, 3500-10000 taka for cotton silk . Traders of Pathrail, Rana Basak, said the business was somewhat fine this year. The demand of cotton saree is higher compared to the other verities. Some businessmen alleged that, the demand of Tangail saree has decreased because of the influence of the Indian share in the local market. The sale of Tangail saree may have increased more if the influence of Indian saree could be controled. Trader Ragunath Bashak said there requires government initiatives and earnest effort to control the sway of Indian saree in the local market. If government could do so then a huge amount of foreign currency may earn from the Tangail saree.